Tamiyablog are reporting a Audi Quattro rally 58667 release at Nuremberg this week. Sounds interesting... guessing a similar take to the Lancia 037 re re? @Carrera124 Proper A2 spec with the slight flares. Even if it is a re-re of the Carson body, still nice! This will be a nice treat, I've owned two ur-quattros. I really hope it doesn't! Let's see that bad boy on a stretched GF-01 or a jacked-up MF-01X! ... I am, uh, excited by this development. Will this have a 257mm wheelbase and fit on an xv-01? I'm hoping for this too. My XV-01 needs this shell. Is this a new kit or just the body shell? A good re-release for the shell. Probably in a TA02 chassis. Personally, I prefer that it comes with big wheels like the original. I really hope it's the original body. I always loved that slightly cartoon, vaguely monster-truck look of the original car and I think it would be fun to try to re-create that. If this comes on an XV-01 I'm all over it! Been stalling over an Astute or Top Cat as I've a fair few buggies so a proper off road Audi Quattro would be awesome... Fingers crossed.. I saw this when I was tired and assumed it was a static model. Didn't realise it was going to be an RC car. Looks amazing! 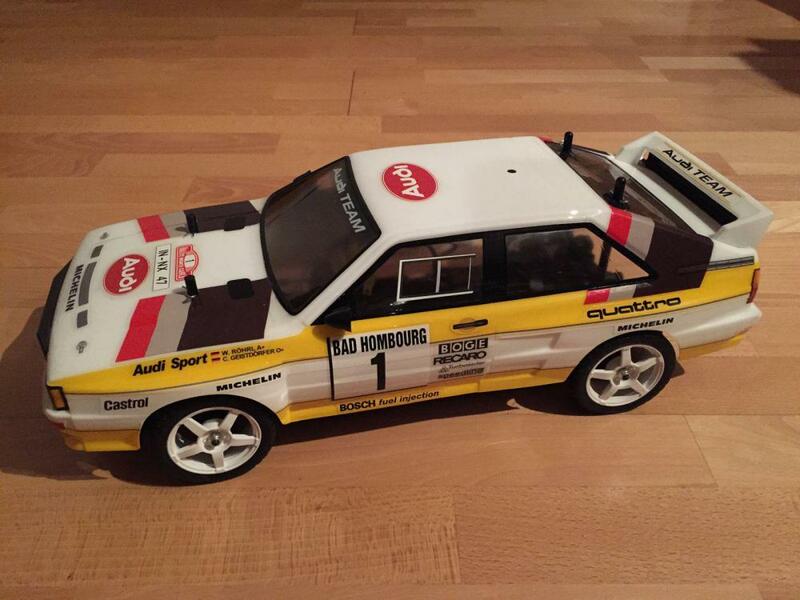 When I was a teenager I always wanted a Audi Quattro rally car shell. At the time I never knew about the original Tamiya version or the Carson 1/10 body. Carisma also produced a 1/10 RC Quattro, and imho the shell looks better than the Carson body. A fairly reliable source indicates it will be on the TT-02 chassis. So apparently 251 or 257mm wheelbase and a new body. Carisma﻿ also produced a 1/10 RC Quattro, and imho the shell looks better than the Carson body. @Carrera124 - Yup, I have the Carisma Audi urquattro A2 shell and sticker set. By the looks of the new Tamiya body photo above, it shows the six front mounted rallye spec lights and older graphics, which is nice addition. Show photos will hopefully show us more. And having thought about it, an Audi Quattro on the XV-01 would be a phenomenal combination, even though it will likely end up on the TT-02. Perhaps another chassis release will come later, as was the case with the Lancia Delta. I will buy one! So great news! Best would be a re-release of the old Quattro from the 80s but propably will be a shell on a TT-01 or something like that. Anyway, a must have for me. Does anyone know how long after the Nuremberg show the new releases get released for sale? I had guessed it would be ABS and on the TA02 S.
Would be cool if it was a new streched lexan body with the original styrol or abs panels back and front, like the original release but for a 257 or 251 wb.